When we talk about the monetisation of English football, with all its pros and cons, most people refer to 1992 with the advent of the Premier League and the acceptance of Sky’s shilling. Its 2003 however when the real change occurred. This was when, according to Arsenal director David Dein, Roman Abramovich first parked his tank on the lawn at Stamford Bridge and started firing £ 50 notes around. The story goes that Abramovich had become enthralled by English football after watching Man Utd play Real Madrid early that year and instructed his minions to find him a club. The Russian billionaire is a notoriously secretive Scorpio and we will perhaps never know the real truth, but Capricorn Research suspects it might have had more to do with establishing a profile in the west that would make him immune to any possible criminal proceedings in his native country. But why Chelsea ? Presumably this was because they were one of the few big clubs that were available for sale at the time but it was a close thing. If Chelsea hadn’t beaten Liverpool in the final game of the 2002-3 season to clinch a place in the Champions League, Abramovich would probably have looked elsewhere. At the time it was claimed that game was worth £ 20 million, with hindsight it was about 50 times that. A look at their charts would normally show why Abramovich chose Chelsea. The synastry is rather odd. 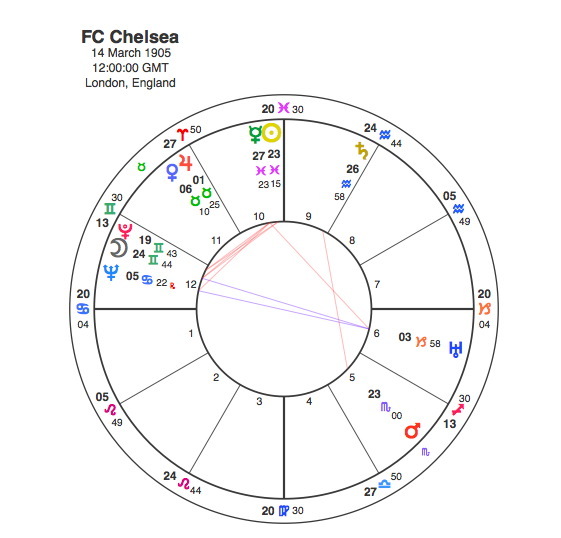 There are no connections between Abramovich’s Sun or Moon and any major points in the Chelsea chart but strangely enough the Chelsea Sun is exactly conjunct Abramovich’s Saturn. This is the kind of synastry that you would expect from an owner like Mike Ashley at Newcastle or Gillett and Hicks at Liverpool but perhaps it shows the enormous financial investment involved. The year 1966, when Abramovich was born, featured Saturn in Pisces opposite to and overpowered by the Uranus / Pluto conjunction of the mid Sixties. The chart for Chelsea gives the Sun at 23 Pisces square to a Moon / Pluto conjunction in Gemini. The first time that Pluto aspected this grouping was in the 1950s. Pluto was sextile itself when Ted Drake became manager in 1952, and went on to sextile the Moon in 1955 when they won the League for the first time. In 1967 when Dave Sexton took over from Tommy Docherty, Pluto was square itself, it went on to square the Moon in 1970 when the Blues won that dramatic F A Cup Final against Leeds. So Chelsea’s Pluto is an immensely important part of the chart. Its interesting to note that its at 19 degrees 43 Gemini. 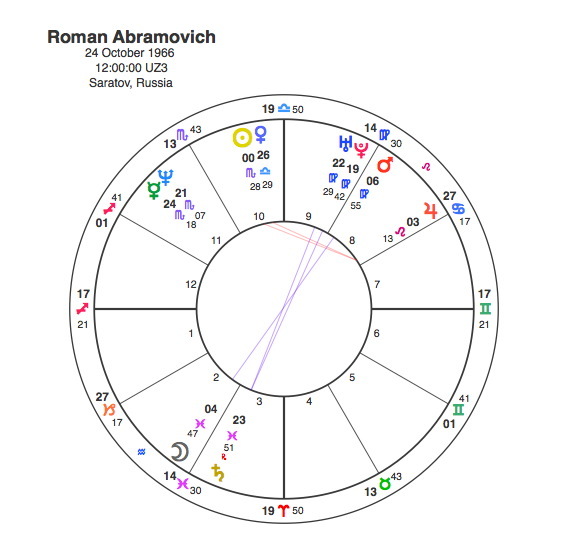 Roman Abramovich has it at 19.42 Virgo. In June 2003 when Abramovich bought Chelsea, Pluto was at 19 Sagittarius, opposite its natal position in the Chelsea chart. Pluto went on to oppose the Moon and square the Sun in 2005 when under Jose Mourinho, they bagged the League for the 2nd time.